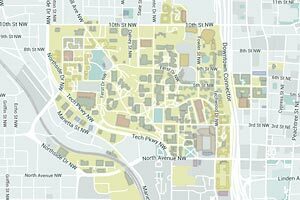 GT MAP is a place for research discussion and collaboration. We welcome participation of any researcher interested in discussing his/her project and exchange ideas with Mathematicians. Mathematics can provide useful tools and insights to different research projects, and GT-MAP is to provide a channel of various discussions. Feel free to consider giving presentations in our seminar series and workshop, or just walk on over to the Math department on Friday afternoon for seminars, or to discuss, or just for a coffee/tea. We expect to sponsor one post-doctoral position, housed in the School of Mathematics, starting in Fall 2019. This is a two year position and is intended for recent PhDs in Applied Mathematics, with demonstrated evidence or potential to carry out research of the highest quality, and have a commitment to high quality teaching. Ability to collaborate with other units across Campus is a definite plus. Interested applicants should do so via Mathjob.org and indicate the "GT MAP post-doctoral position" in their cover letter. Please join our GT-MAP mailing list here. If you are interested, here is a link to School of Mathematics weekly Seminars and Colloquia. The first GT MAP Workshop on Materials, August 17- 19, 2016. Working Group for Problems in Transport and Related Topics in Graphs, May 9-10, 2017.